WE BELIEVE that yoga and fitness can forward the journey to health and wholeness. Embracing a lifelong devotion to the well-being of one amazing individual: you. On many levels, your practice reflects your own evolution; physically, mentally, emotionally and spiritually. Much like your life, it is a work in progress. WE BELIEVE the search to become happy, healthy humans — and also pursue a higher level of consciousness — defines the very quality of our lives. Yoga and other exercise continuing over a period of time take you to a realm we can describe only as transcendent, and we’re here to help. This is our hope for your practice. WE BELIEVE that everyone has personal fitness goals. We applaud that. Even more, we are dedicated to your having a transformational experience that helps you realize a life of vibrant health, balance, joy and inner peace. When you become a part of our community, you are honored for who you are, and where you are in your practice. WE BELIEVE, in the philosophy of Bikram Yoga’s founder, Bikram Choudhury, that it’s about energizing and strengthening the body as well as developing the mind. 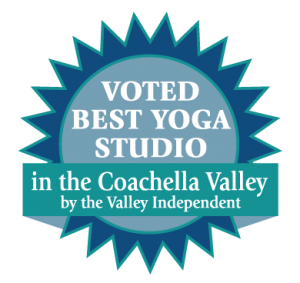 It is in this spirit that we conceived Bikram Yoga Plus Coachella Valley (BYPCV). We will do everything possible to facilitate your practice. This is how we serve. And why we exist. Self love, pure and simple. WE BELIEVE that to care for your health and fitness, to be devoted to what improves your body, mind and spirit is, in its purest form, an act of self-love. Embracing who you are with acceptance, gratitude and compassion is at the heart of being happy and fulfilled. Add dedication and discipline for good measure. WE BELIEVE that you are best supported by a community that is kind and compassionate. To that end, everyone in the BYPCV tribe of kindred spirits is a participant in your growth: people with whom you can connect and develop relationships as you pursue your practice, your fitness and the aliveness that comes with authentic health. It was only natural that, along with our studio transformation, we redesigned the logo. Our beautiful yogini is meant to express in tangible form the attributes of wellness, playfulness,sexiness, femininity and fun. She is both aspirational and inspirational, designed to embody our devotion to health and wholeness, balance, joy and inner peace. And, above all, self love. For self love is at the heart of caring for body, mind and spirit, remaining dedicated to our practice. With a bounty of classes (more than 60 offerings at this moment) from Bikram Yoga to Yin, Hot60, Vinyasa, Trapeze Yoga, Chair Yoga, Inferno Pilates, and so many more (click here for the complete listing), we are confident you’ll find the right class, or combination of classes, for you. 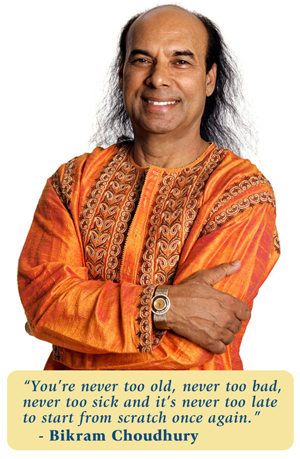 Above all, know this: in the words of Bikram, it is never too late to begin. Whatever path has brought you here, we’re delighted to have you join us. We value you more than you can imagine, and greatly look forward to being a part of your journey.